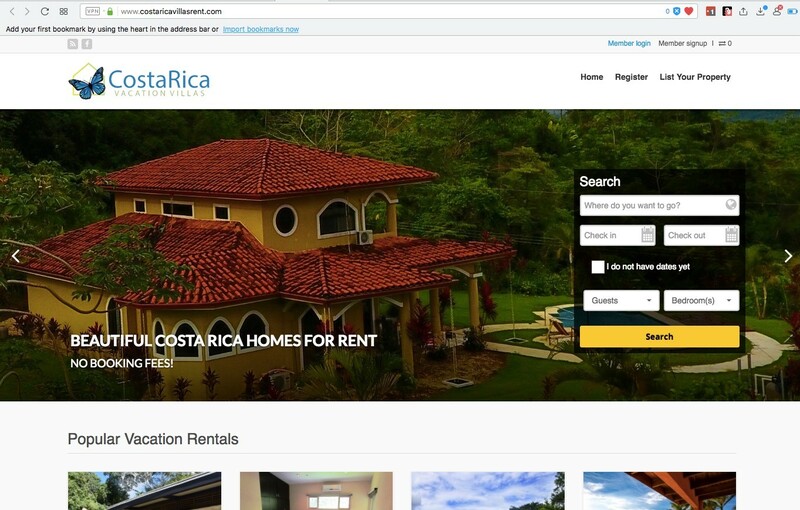 Osa Property Management has recently joined the "No Booking Fee Vacation Home Rentals" model for all of the properties that we manage in the southern pacific zone of Costa Rica. Our commitment is to make visiting Costa Rica a great and enjoyable AND affordable experience. Vacation home rental sites like VRBO have quietly been increasing their fees to customers over the past couple of years. Home owners are typically comfortable (to a certain financial point) with paying the hosting company a fee per booked guest, however, VRBO has now started charging the customers an additional fee - a fee which increases the cost to the customer. These fees, when added together can be over 15%! Contact information between homeowner and prospective client are immediately known. Once a prospect sends his/her information on the website, the homeowner or property manager is immediately notified and contact information is known. We are financially investing in the new website, so we are committed to its success. If you are a homeowner or property manager anywhere in Costa Rica, please visit the site or contact us for more information. Sometimes we all need a break...even when we live in Costa Rica. 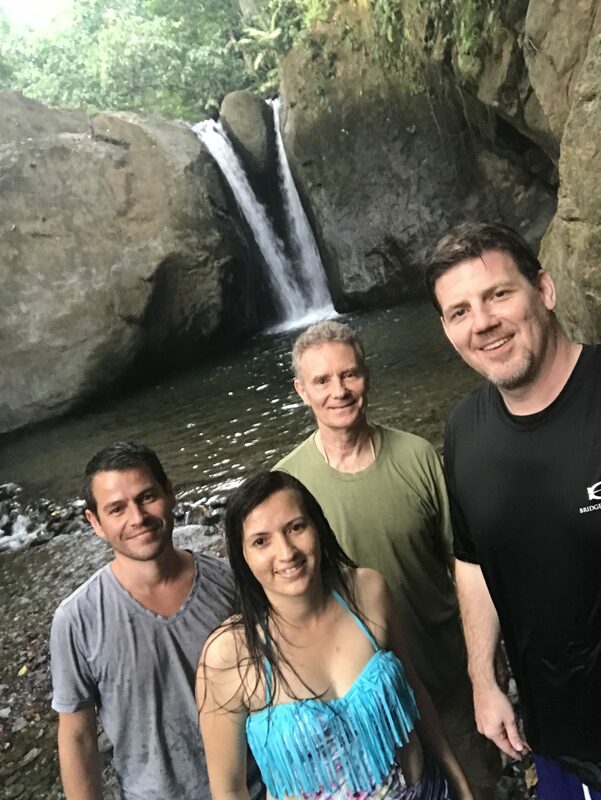 Recently a small group from Osa Property Management (and an architect that is working with us on a project) visited and enjoying Pavones waterfall. 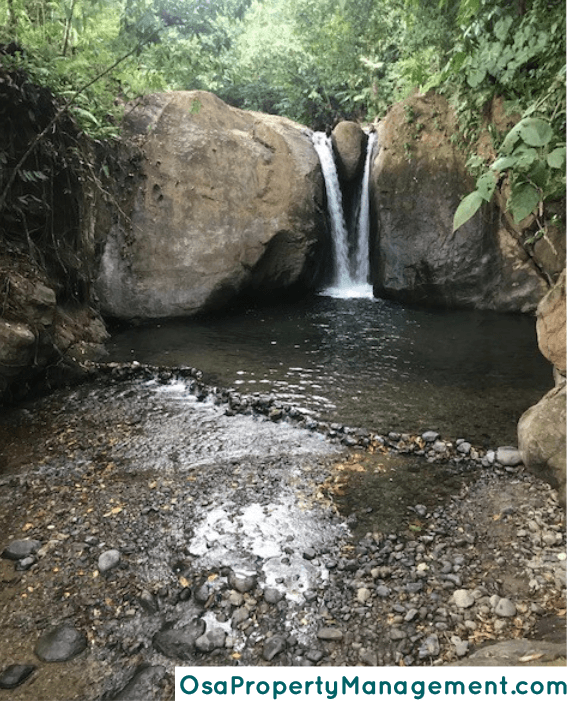 This increasingly poorly kept "secret waterfall" is a wonderful place, especially during the warm season, to cool off from the hot and humid weather. The pool is crisp and clean and invigorating!! The safest time of year to go swimming in the water is typically during February and March - towards the end of the dry season before the heavy rains start to fall - which fills up the creek. "The Rock" is a naturally occurring phenomenon, and has been there for as long as anyone can remember. When enjoying Pavones waterfall, all you will need is a pair of sandals, or footwear, that you don't mind getting wet. Arriving at the Pavones Waterfall is quite simple. Head east from the Costanera Highway, just north of Punta Mala, and follow the gravel road for approximately 5 km (3 miles). The only real landmark between the Pavones waterfall and the Costanera Highway is the first (of two) tilapia restaurants on the road. Most of the time was spent swimming, relaxing, skipping rocks and talking. If you are interested in learning on where this waterfall is, or any other tour in the area, please fill out the Contact Us form below. This can be done by yourself and is free.